When political candidates go door knocking in their ridings, it’s a team effort. Staff and volunteers fan out ahead, trying to find the addresses with people at home. When they find a voter who’s interested, the call goes out, and the candidate comes running over. Literally: running. “That explains the black yoga pants,” I think as I try to keep up with Chrystia Freeland on a residential north-south street in Toronto’s Little Italy. Dodging traffic, the Liberal MP for Toronto Centre zigzags from one side to the other, obeying her staffers’ shouts and hand signals. (All parties preach law and order, but jaywalking regulations are the first casualty of electioneering.) According to my FitBit, we are logging about 3,000 steps an hour. After a while, it feels like hard work. And far from glamorous. In reporting her 2012 book, Plutocrats: The Rise of the New Global Super-Rich and the Fall of Everyone Else, Freeland traveled to some of the most exclusive enclaves on the planet. Here in Little Italy, by contrast, I watch her spend ten minutes talking politics with a lovely young couple whose homey porch decor is dominated by a single gigantic Smurf. Sure enough, the first voter we come across is thrilled to talk dollars and cents. He’s a middle aged man loading a sofa into the back of a van, but he drops everything so he can listen attentively as Freeland makes the Dodge-approved case for a deficit-funded infrastructure play when interest rates are low. Even when the sofa-loader mentions that he lives in Mississauga, way outside the riding, Freeland keeps going. She’s totally into it. But her campaign manager, a young fellow named Ben Bergen, would prefer to see his boss speaking to people who actually have the legal right to vote for Freeland. As he gently ushers her away, she’s still cheerfully ticking off points about the “secular decline” in global demand. Freeland seems perpetually chipper, even when she’s hip-deep in the fine points of fiscal policy. Moments later, Freeland finds herself face to face with Kevin, a local voter with clipboard in hand who’s been doing some door-knocking of his own. He’s about thirty, dark hair, serious-looking. Polite, but very activist-y. “Would you like to wear one?” he asks Freeland, offering a gift. She looks down and sees a button emblazoned with the words “Kill Bill C-51.” Freeland gives him a “nice try” smile and demurs. Kevin laughs at his gambit. Then things get more serious as the two spend the next five minutes debating over whether Trudeau made the right call by voting for Stephen Harper’s 2015 Anti-terrorism Act. “You know that we are repealing very important parts of C-51,” Freeland tells Kevin. “We would have a sunset clause. In fact, we’d put forward significant amendments to C-51 that the NDP voted against.” After that, the two go back and forth over the best tactics for blocking the most intrusive aspects of C-51. Kevin says he’s voted Liberal in the past, and that his anti-Bill C-51 group is non-partisan. But it’s quite obvious that he’ll vote NDP—which rejected C-51 in its entirety, and has pledged to strike the law down outright once in power. Freeland knows full well she’ll never get Kevin’s vote, but she’s determined to make her case anyway: This man will be knocking on hundreds, perhaps thousands, more doors between now and election time. If Freeland can dial down his anti-Lib attitude by even a shade or two, that’s a win. They part amicably—Freeland’s smile never quite leaving her lips. Over the course of the afternoon, C-51 is the largest single challenge facing Freeland in this densely progressive part of the city. The Conservative negative ad campaign is teaching voters to regard the election as, in part, a referendum on Justin Trudeau’s maturity. Yet with Freeland, I didn’t hear a single voter bring up Trudeau’s experience or personality—for better or worse. It’s been more than two years since he has been Liberal leader. These people seem a lot more interested in his policies than his hair. The block we’re on—a north–south street connecting Bloor with College Street—is dominated by tall, solid-looking brick houses. It’s an extremely respectable neighbourhood in transition from ageing Italian and Portuguese immigrants to reno-happy couples and young couples. 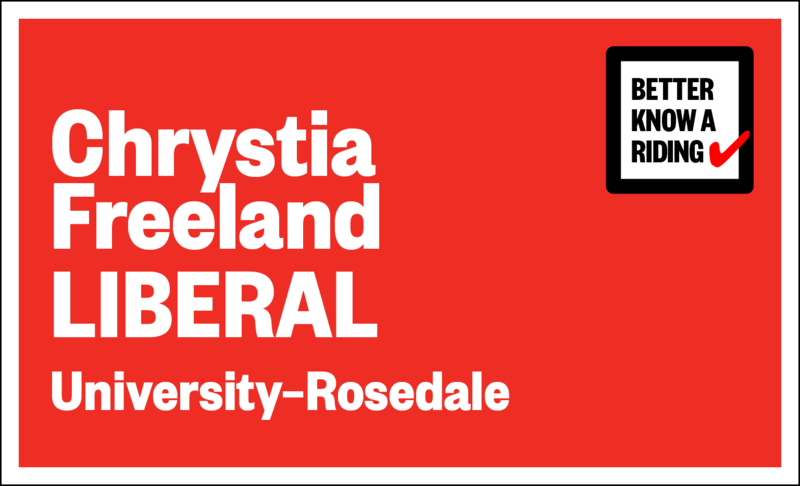 The electoral map is in transition, too: Though Freeland is the sitting MP for Toronto Centre, she’s now running for the newly created riding of University–Rosedale (which includes much of her old riding). She brings a map to help voters understand that she hasn’t been parachuted in. “I live in your riding,” she emphasizes. “My kids go to play dates around here. This is my home.” Not all voters want to hear about David Dodge, infrastructure, or C-51. Some just want to know that a candidate’s home is within walking distance. In some cases, voters are happy to sit back and listen to Freeland talk about anything she pleases. “What’s your pitch?” asked one woman answering the door of a triplex. “Tell me all about yourself.” Freeland launches into her impressive elevator pitch: She’s lived in Russia, Ukraine, New York, London, Italy, and Canada. She’s witnessed the collapse of communism, delivered TED talks, and won prestigious literary prizes. The woman seems deeply impressed. On the strength of her CV alone, Freeland appears to have made this sale. At other homes, I have no idea how Freeland makes the sale—because she’s making it in fluent Italian (her other languages are French, Russian, and Ukrainian). In other cases, she converses in quasi-Portuguese, which involves Freeland speaking Italian with a handful of Portuguese word substitutions, and the homeowner doing likewise, but in reverse. Based on the number of Liberal lawn signs these nonni are agreeing to put on their properties, she’s clearly doing really well. No C-51 questions here, apparently—but plenty of hugs and cheek kisses. A lot of these people came to Canada when Pierre Trudeau was in power, and they’ve been voting Liberals all their lives. One woman enthusiastically calls Freeland over from her second-floor balcony to tell Freeland she’s a fan. Even after running out of lawn signs, and nearly four hours walking, Freeland gets ready to head back up the next street for more door knocking. First, though, she dips into a meat market at the corner. I follow her, looking for one last chance to see her press the flesh with Little Italy’s voters.